There are 17 Assisted Living Facilities in the Cedar Rapids area, with 12 in Cedar Rapids and 5 nearby. The average cost of assisted living in Cedar Rapids is $3,868 per month. This is higher than the national median of $3,346. Cheaper nearby regions include Marion with an average starting cost of $3,189. To help you with your search, browse the 84 reviews below for assisted living facilities in Cedar Rapids. On average, consumers rate assisted living in Cedar Rapids 4.2 out of 5 stars. Better rated regions include Marion with an average rating of 4.3 out of 5 stars. Caring.com has helped 5 families in Cedar Rapids find high-quality senior care. To speak with one of our Family Advisors about assisted living options and costs in Cedar Rapids, call (855) 863-8283. Like Paris, France, Cedar Rapids, IA, keeps its city government on an island in the middle of the river that runs through town like a ribbon. All around that island, 23 assisted living communities provide safe, comfortable living environments for local seniors. These facilities are inspected by the Iowa Department of Inspections and Appeals, which monitors health and safety, as well as hearing complaints from residents and their families. Assisted living communities in Iowa provide their residents with as much privacy and independence as possible, along with help handling activities of daily living (ADLs), such as meal prep, taking (some) medication and personal care needs like bathing. Cedar Rapids' weather makes for mild summers and sometimes-chilly winters. Overnight lows in winter can drop to 13 degrees Fahrenheit, though summer highs rarely top 89 degrees. Cedar Rapids gets about 38 inches of rain a year, mostly in spring, so seniors with respiratory issues might want to be careful about pollen and other allergens then. Cedar Rapids is a slightly cheaper place to live than elsewhere in the United States. Groceries here average 94 percent cheaper than the national median, which is good for seniors who buy their own supplies, while the transportation many aging citizens without cars depend on costs about 95 percent less than in most other places around the country. Iowa charges a progressive state income tax of between 0.36 and 8.98 percent on most income. SSI and some types of retirement income are exempt, however, which is something to check with a financial adviser about. Crime in Cedar Rapids is average for a city of over 140,000 people. In most categories, the local rates are either at, or just slightly above, national rates for crimes against property and people. Violent crime is lower than average, however, which makes safer streets for active seniors who like evening strolls. Cedar Rapids Transit operates bus routes in and around the Cedar Rapids municipal area. Seniors over 60 get discount fares with a valid senior ID card, and dial-a-ride services are available if a sudden appointment or pressing social call comes up. The Cedar Rapids area is home to world-class medical facilities, including Mercy Medical Center Cedar Rapids, in the event of medical emergencies or illness. Assisted Living costs in Cedar Rapids start around $3,868 per month on average, while the nationwide average cost of assisted living is $4,000 per month, according to the latest figures from Genworth’s Cost of Care Survey. It’s important to note that assisted living rates in Cedar Rapids and the surrounding suburbs can vary widely based on factors such as location, the level of care needed, apartment size and the types of amenities offered at each community. 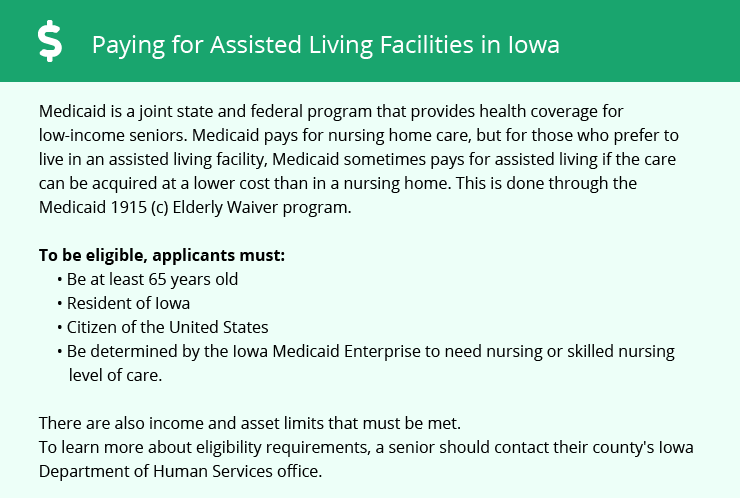 The Iowa Medicaid HCBS Elderly Waiver is a managed care plan that helps low-income seniors pay for the cost of assisted living in Iowa. This plan is provided by the state as part of its Medicaid partnership with the federal government. To see a list of free assisted living resources in Cedar Rapids, please visit our Assisted Living in Iowa page. Cedar Rapids-area assisted living communities must adhere to the comprehensive set of state laws and regulations that all assisted living communities in Iowa are required to follow. Visit our Assisted Living in Iowa page for more information about these laws.